Birthplace : Chicago, Illinois, U.S.
Earth, Wind & Fire is an American band that has spanned the musical genres of soul, jazz, R&B, funk, and rock. They are one of the most successful and critically acclaimed bands of the twentieth century. Rolling Stone magazine has described them as "innovative, precise yet sensual, calculated yet galvanizing" and has also declared that the band "changed the sound of black pop". Earth, Wind and Fire took the world of pop music by storm in the mid-1970s with their infectious blend of rhythm and blues, rock, and soul--a sound destined to be imitated by many groups, but never successfully duplicated by any other. From the start, Earth, Wind and Fire appealed to a widely diverse audience; as one of the first black rock/soul groups to cross over to a white audience, they paved the way for the entire rhythm and blues/pop crossover phenomenon of the late 1970s and the 1980s. Built on danceable funk, Latin, and African rhythms, layered with lush horn arrangements, and topped by the sweet falsetto voice of lead singer Phil Bailey, the group's music urged listeners to enjoy life, to love, and to be open to the positive and mystical aspects of the universe. Over the years Earth, Wind and Fire saw many members come and go from its ranks, but founder and guiding light Maurice White always remained at its heart. Like his brother, Verdine White, Maurice was among those who originally assembled to form the group in 1969. White was born in Chicago, but moved with his family to Memphis when he was still young. There, he began his musical career at the age of six, when he joined a gospel choir. As he grew older, Maurice became fascinated by marching bands and drill teams; this interest led him to take up the drums. He had his first professional gig in high school as part of a band led by Booker T. Jones of the MG's. After high school, White returned to his home town to study music at the Chicago Conservatory. He furthered his education with club gigs on the side, and eventually got work as a session drummer for Chess Records. Throughout the 1960s, he worked with many top Motown and Chess recording artists and for other Chicago notables, including the Impressions, Billy Stewart, and Muddy Waters. From 1967 until 1969, White was a part of the Ramsey Lewis Trio. He told Melinda Newman of Billboard that his time with Lewis proved to be a major influence on his musical philosophy: "I wanted to come from something right in the footsteps of where he was coming from ... something that was musical, yet still entertaining, and something where the subject matter touched your heart." Lewis also introduced White to the kalimba, or African thumb piano, the sound of which would become an enduring Earth, Wind and Fire trademark. As his days with the Lewis trio drew to a close, White began to envision his own group. His dream was to bring together a sizable collection of musicians so that when touring, he would not have to hire local talent. In 1969, he moved from Chicago to Los Angeles and assembled the precursor to Earth, Wind and Fire. The group, called the Salty Peppers, recorded for Capitol for a couple of years without drawing much notice; in 1971, White signed a new contract with Warner Brothers and renamed the group Earth, Wind and Fire after the elements in his astrological chart. In less than two years, Earth, Wind and Fire released three albums: Earth, Wind and Fire, The Need of Love, and the soundtrack Sweet Sweetback's Baadasss Song. They had two chart singles--"Love is Life" in 1971 and "Evil" in 1973--but by the time the latter was released, White had decided that Warner was not the label for him. He signed a new contract with Columbia. At the same time, he disbanded the group that had begun as the Salty Peppers and assembled a new, younger version of Earth, Wind and Fire. In addition to himself and Verdine, the new group featured vocalist Phil Bailey, who had been working with the Stoval Sisters' Band; Johnny Graham, of the Nite-Liters; Jessica Cleaves, from the Friends of Distinction; and Al McKay from the Watts 103rd St. Rhythm Band. The new group worked well together from the start, and their first Columbia release, Open Your Eyes, went to Number 15 on the album charts in 1974. The band's real breakthrough came the following year, however, after their appearance in the film That's the Way of the World. The soundtrack album from that movie, which featured their music, climbed into the Top Ten album chart, propelled by the success of Earth, Wind and Fire's Grammy-winning single, "Shining Star." They appeared in another film, Robert Stigwood's 1978 release Sgt. Pepper's Lonely Hearts Club Band, and scored another Top Ten hit with their cover of the Beatles' "Got to Get You into My Life." The disco trend made them into true superstars; hit singles, and gold, platinum and double platinum albums became routine. Between 1971 and 1988, they had 38 hits on the rhythm and blues charts, all but six of which crossed over to the pop charts. Changes in the group's lineup were fairly frequent, but never affected its appeal. Their popularity enabled Earth, Wind and Fire to fill huge stadiums when they toured; they used these cavernous venues to their advantage by creating an innovative stage show featuring magic created by the master of illusion, Doug Henning. Mystical trappings such as giant pyramids wowed the audiences, as did the fireworks, disappearances, and the sight of the band "flying" to their places on stage. 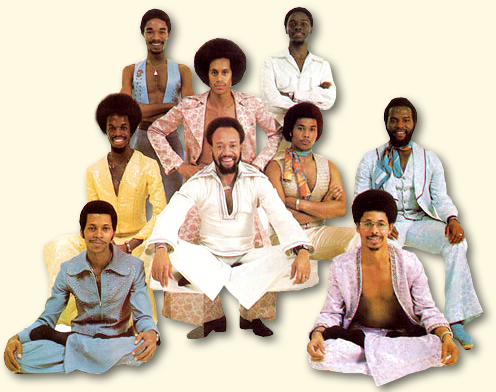 In 1983, after ten years of continuous hits, Earth, Wind and Fire officially declared themselves on hiatus. Maurice White formed his own company, Kalimba Productions, and devoted much of his time to producing and composing for other recording artists, including the Emotions (who were featured on Earth, Wind and Fire's 1979 smash single "Boogie Wonderland"), Ramsey Lewis, Deneice Williams, Valerie Carter, Barbra Streisand, Neil Diamond, and Jennifer Holliday. In addition, White worked on a number of film soundtracks, including Armed and Dangerous and Coming to America. Phil Bailey also launched a successful solo career, topping the charts with "Easy Lover"--a duet with Phil Collins that was featured on the album Chinese Wall--and making his mark in the world of gospel music with offerings such as the Grammy-winning album Triumph! 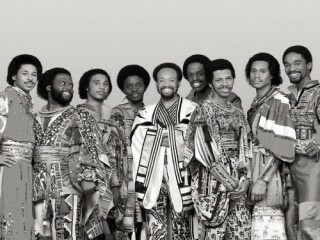 In 1986, Earth, Wind and Fire reunited to record Touch the World, an album they backed with a nine-month world tour, but members went their separate ways again until 1990, when they recorded Heritage. Earth, Wind and Fire's influence on the sound of popular music was evident in their career retrospective, The Eternal Dance, released in 1992. The ground-breaking, 55-track boxed set covered two decades of music, including cuts from long out-of- print recordings from their early years with Warner Brothers, the best of their glory years with Columbia, and a number of previously unreleased tracks. Critic James Hunter remarked in his Musician review of the album: "The Eternal Dance collects some of the most fluent, centered and elastic pop music ever recorded. Its influence is everywhere." The release of the retrospective and the group's years of relative inactivity might have seemed to signal the end of an era, but even as the retrospective was being released, Earth, Wind and Fire was working on new music for the nineties. In May of 1992, the core group of Maurice White, Verdine White, and Phil Bailey went into the studio with a revamped horn section to record Millennium, an album of all-new music. Maurice White had grown unhappy with Columbia Records during the last years of his contract with the organization, feeling that executives there were trying to steer his group in a direction that was not in line with his vision of what Earth, Wind and Fire should be. Accordingly, before going to work on Millennium, he signed a new contract with his old label, Warner Brothers. The result was a classic Earth, Wind and Fire album, filled with their smooth vocals, trademark horns, and sense of spirituality. Commenting on the album's name to Melinda Newman, White joked: "'Millennium' just felt right to me, I didn't even know the meaning to it. When people ask me, 'What does "Millennium" mean?,' I'm going to have to tell them I had to look it up. Or I can just tell them it took us that long to get another album out." The band received another tribute in the following year in the form of a star on the Hollywood Walk of Fame. All the original members of the group attended the inauguration ceremony and in his speech Maurice White attributed EWF's success to the support of all of their fans. As well in 1995 Maurice White decided to retire from touring with the band. At the time he gave his reason for doing so to be that he wanted to take a rest from the rigors of the road. At this juncture Philip Bailey was given the role of onstage leader of the band. On the March 6, 2000 Earth, Wind & Fire were inducted into the Rock and Roll Hall of Fame to a standing ovation during the 15th annual Rock and Roll Hall of Fame induction dinner held at New York's Waldorf-Astoria Hotel. All of the band's original members from the 1973—80 "classic period", namely Maurice White, Philip Bailey, Verdine White, Ralph Johnson, Al McKay, Larry Dunn, Andrew Woofolk, Fred White and Johnny Graham, attended the ceremony, at which the nine of them played together for the first time in 20 years, performing "Shining Star" and "That's The Way Of the World". After their induction into the Hall of Fame an effort was made by the original band members to fully reunite but it ultimately proved unfrutitful. In 2001, a biographical documentary of the band entitled Shining Stars: The Official Story Of Earth, Wind & Fire was released, directed by Kathryn Arnold. Following the September 11 attacks of that year, the band members donated $25,000 to the American Red Cross at a September 13 show at Virgina's Verizon Wireless Virginia Beach Amphitheater which was the band's first concert since those events took place. February 24, 2002 saw Earth, Wind & Fire performing at the closing ceremonies of the 2002 Winter Olympics held in Salt Lake City, Utah. In 2004 Earth, Wind & Fire and Chicago embarked upon a joint national tour, which gave rise to a DVD of a concert that took place at Los Angeles's Greek Theater that was entitled Chicago & Earth, Wind & Fire – Live at the Greek Theatre. This DVD was released on June 28, 2005 and was certified Platinum just two months afterward. Chicago and EWF once again toured together in 2005 and collaborated for a new recording of Chicago's ballad "If You Leave Me Now" that was included on Chicago's 2005 compilation album Love Songs. In November 2011, the band was given the Legend Award at the Soul Train Awards Fox Theatre in Atlanta, Georgia. In 2012 EWF were bestowed with a Lifetime Achievement Award at the 20th Annual Trumpet Awards, held at Cobb Energy Performing Arts Centre in Atlanta, Georgia.Two Earth, Wind & Fire classic songs have been inducted into the Grammy Hall of Fame: “That’s The Way of The World” (2004) and “Shining Star” (2007).